Two interesting things happened this week in Jamie Dimon’s world: two gutsy attorneys, Helen Davis Chaitman and Lance Gotthoffer, published a book comparing JPMorgan Chase to the Gambino crime family, explaining how the bank could and should be prosecuted under RICO statutes for serial frauds against the investing public. 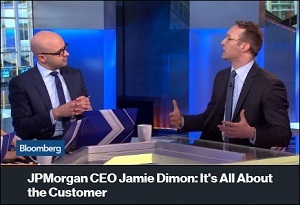 Taking a diametrically different tack, Bloomberg Markets magazine editor, Joel Weber, fawned over Dimon in a Bloomberg TV interview, repeatedly asserting that Jamie Dimon is all about the customer. This Bloomberg video is so hilarious we had to watch it several times to make sure it wasn’t satire. As Weber makes his case that Dimon is all about the customer, his Bloomberg colleague, Stephanie Ruhle, is having none of it, reminding the obviously star-struck Weber that the big banks are hated in this country for good reason. Instead of acknowledging the serial frauds at JPMorgan, Weber suggests (and this is the belly laugh/roll on the floor part) that banks are hated because when you go to a car dealer to buy a car you walk out with one. But if you go into a bank for a loan or credit card, it might turn you down. This brand of logic is on a par with Hillary Clinton suggesting that Wall Street was lavishing millions of dollars on her in speaking fees because she was kind to Wall Street during 9/11. The most damning part of this article is that the fearsome “F” word doesn’t appear once. JPMorgan dates back to 1871. It managed to survive 143 years without being charged with criminal activity. 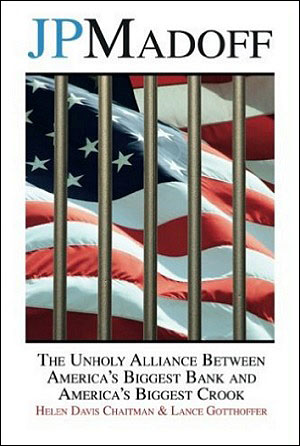 But under Dimon’s reign, it was charged with two felony counts in 2014 under a deferred prosecution agreement from the U.S. Justice Department for its involvement in the Bernie Madoff fraud and charged with another felony count, to which it admitted, on May 20, 2015 for its involvement in rigging the foreign currency market. How could a reporter forget to mention an unprecedented three felony counts in the past two years against Dimon’s story line that it’s all about the customer. Less than three months ago, JPMorgan agreed to charges by the SEC that it had steered its customers into in-house products where it reaped higher profits without disclosing this conflict to the customer. It paid $267 million to settle these charges. If you compare what presidential candidate Senator Bernie Sanders has been repeatedly telling debate viewers on national TV, that the business model of Wall Street is fraud, against the above rap sheet, you understand exactly why the public is angry and outraged at the Wall Street banks and the establishment candidates who take their campaign money and then do their bidding with toothless regulatory appointments once in office. Let’s face it, you don’t become the richest man in New York by dredging up pesky details like felony counts against your largest customers on Wall Street.